How’s business? Our store sales have been a little flat because of online competition, but the trailers are doing well. We’ve spread our customer base beyond Roxboro. If a plant in one town shuts down, there are plants all over who need something so it’s not as bad. We’re able to set up shop right in the parking lot of a factory. People buy work boots before or after their shift. We’re hoping to see a 10- to 15-percent increase in the third and fourth quarters. How important are the trailers to your store’s bottom line? They’re a very strong revenue stream and account for about 80 percent of our shoe sales. It’s just a matter of adapting from a cash and carry business to an accounts business. You get more for your money, but stocking something different each day is a challenge. You also need to satisfy two customers: the person buying and the employer. I always say “S=S” (style equals safety). If they don’t wear it, it won’t keep them safe. What are your leading footwear brands? Timberland Pro is huge for us. Justin, Monolithic and Thorogood also do well. We’ve carried Wolverine since 1946. Back then it was WWII surplus for $3.95 a pair. Anything you’ve added in the last year? We started working with Red Wing, and people love that they’re American made. We’ve also added Footwear Specialties’ Avenger men’s line. In general, we’re focusing more on styles that have composite toes compared to steel toes. They’re lighter and cooler in hot weather. Customers also like the savings. What percentage of your total business is shoes? About 70 percent, which is a pretty decent chunk. Oftentimes, we can sell like 50 pairs by 9 a.m. on the trailers. Sometimes it’s a once-a-year stop for us, but in other case we can make two or three visits a month. Any popular accessories? Our Footwear Plus socks, made in North Carolina. They’re durable and the elastic won’t slide down. We started making them eight years ago as something to give people to remind them of us on a daily basis. Any plans to sell online? Eventually we will have to, but until then I’ve been finding an easier way with the trailers. There’s so much competition online. Rather than chasing something, we’re trying to stay ahead of the curve in other ways. We’re also creating our first catalog for the safety industry. We’ve been adapting since 1946. Daddy always said, “Either you grow, or your competition grows.” We intend to keep growing. In addition to the trailers, how do you reach new customers? For local sales, word of mouth is the best way. Happy customers spread the word. We also do a lot of social media and exhibit at safety shows and conferences, hawking the Footwear Plus difference. What’s your take on the so-called retail apocalypse? I’m noticing the effects. Folks don’t shop as much vs. looking online. I would like to think it will swing back. We’re offering customers something they can’t live without and can make their lives easier. You can’t get that type of service/knowledge online. What do you love most about being a work specialty retailer? Working with customers. I love when they ask for help and I say, “You need this and this.” Those are great interactions because they’ll often come back a year later asking for another boot just like it. That’s satisfaction. It reminds me of stand-up comedy: You spend 10 minutes figuring out who they are, what they need and how to satisfy them, then do it all over again. My job is fast-paced, challenging and fun. What are you most proud of? No. 1, I’m proud of our history—that we’ve been in business for 72 years. We have a good name that folks trust. Boots that can run as much as $170 require a leap of faith for some people. We treat everyone fairly to make sure they get the shoes they need. At the end of the day, we’re trying to feed our families just like the workers we wait on. We all have the same goal. I’m also proud that this remains a family business. My wife is a very integral part, working in accounting. Where do you see Footwear Plus in five years? 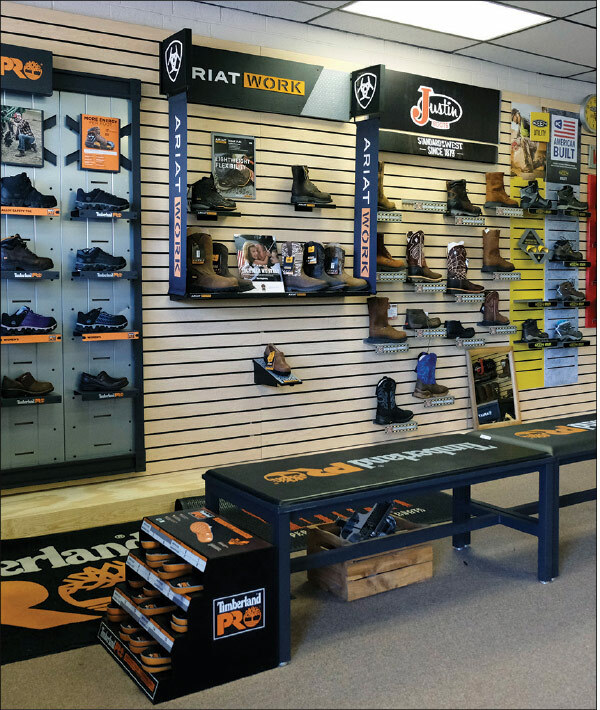 I see us as a bigger player in the regional safety shoe market. I’d like to think we’ll have five trailers to cover the I-95 corridor from southern Virginia to South Carolina. We want to be profitable and happy. If you’re enjoying yourself, everything falls into place.